Posted by Jace Stolfo on Friday, March 12th, 2010 at 1:32pm. Ada County real estate sales were up about 32% compared to the same time last year. Boise, Meridian, Star, Kuna, and Eagle Idaho had a total of 350 home sales compared to 265 last year. This is the 9th consecutive month where monthly home sales outpaced the previous year. 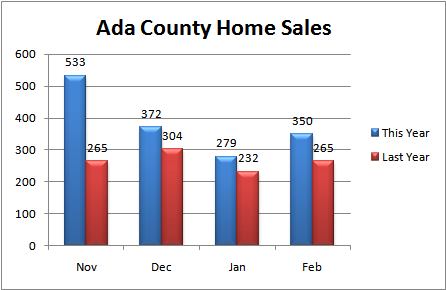 The column graph below shows Ada County real estate sales by month compared to last year. The 32% increase in Ada County real estate sales is the third largest in the last 9 months. 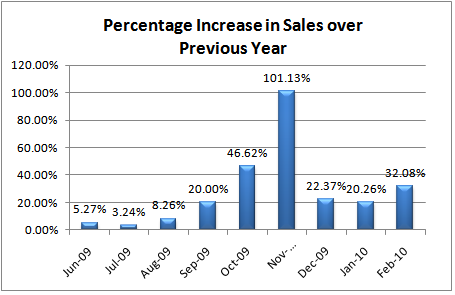 As you can see below, home sales have outpaced last year by as little as 3% and as much as 101%. Ada County foreclosures made up 50% of the real estate sales in February. There were 175 non-foreclosure sales, 102 bank-owned (REO) sales, and 73 short sales. With an average of 3038 homes for sale in Ada County during February, inventory has decreased about 21% compared to last year. The February absorption rate was 8.7 months, down slightly from 10.7 in January. Search the Ada County Real Estate market here. You can also learn more about Boise, Meridian, Star, Kuna, and Eagle Idaho.